It doesn’t always make sense to us at the time of suffering, but God really does turn the hard things of our lives around for good when our hope is in Him (Romans 8:28). 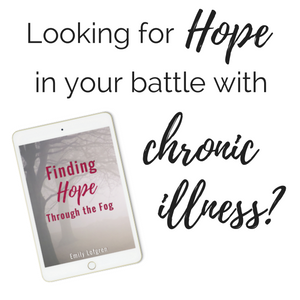 When our lives look different than we’d imagined because of chronic illness, there’s a grieving process many of us go through. We look at our former lives and selves and think about the dreams we once had. Lately, as I’ve been seeking God about ALL THE THINGS surrounding how my life looks as I treat chronic illness, I’ve had a strong sense of peace. I won’t pretend it isn’t hard to let go of how I thought I’d live. I won’t pretend that chronic illness hasn’t been the hardest thing I’ve ever experienced. I won’t pretend I actually like doing coffee enemas. Life with chronic illness is incredibly difficult. But part of the Christian walk – part of living life here in a broken world – includes suffering. In following Christ, we choose to surrender our will and seek after Him (Matthew 16:24-26). When we choose to follow Christ, we admit that we are weak. That we can’t do this alone and that, as hard as it may to come to terms with, we are not invincible. And you know what? It’s actually a good thing. Having multiple chronic illnesses reminds me of this. Every day, instead of trusting in myself to pull through, I have the opportunity to trust in God. When I’m at the end of what I can do and it’s still not enough, I have faith that God will be enough. He will provide. So as I spend my days using the far infrared sauna and drinking bone broth protein shakes while I lie on the couch in pain instead of going out into the world to “be productive,” I am reminded that I’m not in control. Even my greatest efforts won’t be enough to get all my needs met. The thing is, each of us, chronically ill or not, needs the grace of God. We need to experience His presence. Instead of looking at each day and feeling like I’m missing out because chronic illness has caused my life to be different than I expected, I can embrace each day as another opportunity to know God more. It’s another opportunity to rest in His presence. And that will always be enough. Personal prayer support at any time! Success! Now check your email for your eBook! Terry! That means so much to me. Thank you!! It is so hard to find the joy on some days. Thank you for the reminders!